This is one of the most-often asked questions by property investors who feel bamboozled by the mix of negative media commentary and the hype of property investment spruikers. I have seen property investors hang on and on, waiting for the best time to buy in case the market may drop lower or waiting in a rising market as they think the horse has bolted and it is way too late. 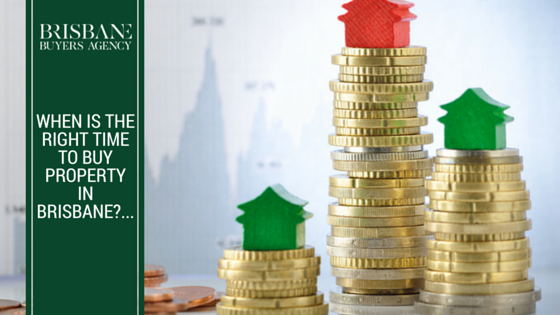 The fact of the matter is – property is a safe, long term investment and the best time to enter the market is whenever it is practical for you to do so. Waiting longer than this will see you lose potential investment value. World and local events impact perceptions about when to buy. If you stop and reflect on some recent events would you have invested in the following periods? More recently we have had the Brexit. If we look at the graph above we see Mr Buffet’s view is extremely applicable to property. It always holds its value long term – despite what is going on in the short term. The graph above shows us that regardless of turbulent economic times prices will recover. In recent times, the Global Financial Crisis (GFC) was a set-back. However if you had stayed in the market you would have recovered your unrealised losses within two years. Banks also regard property as a secure investment. They know that property holds its value. For example, an investment of $250,000 in Wavell Heights in 2001 (September 11 disaster) was worth $490,000 by 2010 and today is worth approximately $630,000. The same results exists across many suburbs. In Bardon the median house price was approximately $265,000 in 2001, by 2010 it was $730,000 and now it is approximately $850,000. My biggest concern is seeing clients waiting for the perfect time to come into the market. At the end of the day it’s the time you spend in the market that will make all the difference to the success of your property portfolio. The historical data above shows the best time to come into the market is soon as it is practical for you to enter the market. As long as you understand your financial situation and your borrowing capability, and you adopt a long-term sensible approach to buying, and you know what makes a “smart” buy, you will always be in front. 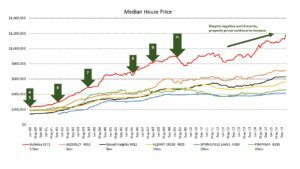 Smart buyers’ tips: What indicators do we consider? As you can see there are quite a few factors to consider here as property economics is a complex living organism. Also at this time we would strongly advise against buying any unit in Brisbane. There is a complete oversupply and investors may not be able to rent good quality apartments in inner-city seemingly blue-chip locations. 1. Our Smart Buyers Index gives our clients the inside running on the true property hotspots in Brisbane. Our proprietary property analytics tool, the Brisbane Buyer’s Agency Smart Buyers Index, focuses on finding the “micro-economies” in local suburbs so our clients can find the best deal possible. When you work with us you will find the real property investment hotspots or as we like to call them ‘smart buying opportunities’ in the Brisbane market. how to interpret variances in the sales data to make realistic offers that vendors accept. We work on a flat fee arrangement, we do not work on commission, so you know exactly what your costs will be up front. As registered valuers and quantity surveyors, we have inspected thousands of properties so we know what we are looking for in a property. the neighbours – will they be friendly? how the area fares in heavy rain (compared to the Brisbane City Council flood maps)? other potential local issues that could turn what looks like a good investment on paper into a very difficult situation in real life. To book your “Brisbane Property Buyers Strategy Session” register at the form to the right of this blog, call 0409 499 034 or email paul@brisbanebuyersagency.com.au.